For day 2 under the theme Cooking from Kids story books / T V shows for BM 54, am here with another simple dish which kids can also make by themselves. 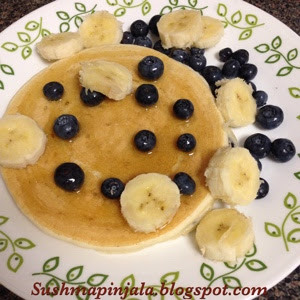 Just 3 ingredients that's it yummy pancakes are ready for their breakfast. This recipe is from one of the New Zealand based kids TV show. The TV shows are uploaded on web Four Kids, which not only has recipes for kids but also has games and other activities. As kids are having summer vacation I made them help me in kitchen mixing the batter. They had their favorite honey and whipping cream as a topping. Serve your family with their favorite toppings to enjoy this simple and delicious breakfast. Combine all the 3 ingredients in a bowl and mix. Mix till it becomes a smooth batter. Heat skillet or pan and spoon the mixture onto pan. Cook for 2 minutes and flip to cook on other side. Remove after cooking for 2 minutes and serve with your favorite toppings. Today we are starting with 4th week of BM 54. My theme for this week is very interesting Kids Delight-Cooking from Kids story books / TV shows. For day 1 am here with a simple and kids accepted dish which is Biscuits. Found this recipe in my Son's 3rd grade Reading book where the complete lesson is about cooking and baking different types of food. As its a Kids theme, my kids helped me in preparing these simple delicious biscuits. I just followed the recipe which is given in the book. Use a fork to add the shortening to the flour, baking powder and salt. The mixture should look like fine crumbs. Add enough milk so that the dough rounds into a ball. Put the dough on a floured board and knead it 10 times . 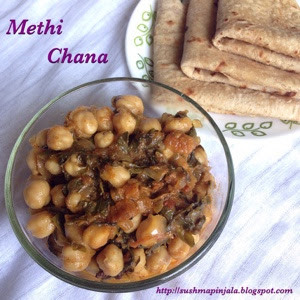 Chole is one of our family favorite food, which is usually served with poori, roti or naan. This protein packed dish is very simple to prepare and delicious to taste. My son loves chole with poori. Today to try something new I have added fenugreek leaves to this dish, which gives some extra flavor and fragrance to the dish. This is my neighbor and a very good family friend's recipe. Last week we all met at my place for an unplanned dinner. We did't want to cook anything new, so had all the leftovers from both of our kitchens. My friend bought this chole and blackbean curry which she made by adding fenugreek leaves. We all loved it specially my son. So thought why not try the same dish for day 3 of BM 54, under the theme " Lentils in 3 ways". So today I have prepared the dish with just the chickpeas and fenugreek leaves skipping black beans. Lentil recipes are used throughout South Asia, the Mediterranean regions and West Asia. They are also combined with rice, which has a similar cooking time. A lentil and rice dish is referred as Mujaddara in Arab countries. They are also cooking together into Khichidi a popular dish in Indian subcontinents -India and Pakistan. South Indians make sweet and hot pongal with rice and lentils. 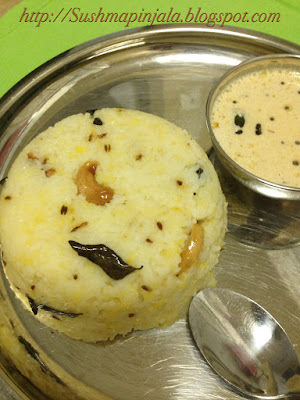 Ven pongal is a very easy and comfort food which is very popular breakfast dish in Tamil Nadu. This particular South Indian rice dish is offered to god at temples. This dish is usually served with coconut or peanut chutney and Sambar. It depends on your taste what kind of chutney you like. So this delicious and famous rice and lentil dish goes to the 2nd day of BM 54, under the theme " Lentils in 3 ways". 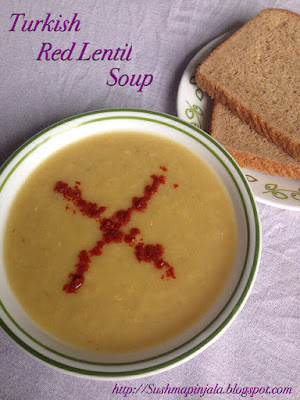 Starting today I will be posting 3 healthy and delicious Lentil recipes. For Week 1, day 1 of BM 54, under the theme " Lentils in 3 ways".Lentils are Worlds one of the healthiest foods. Lentils are the edible pulse, Lentil colors range from red to yellow to orange, green, brown and black.Lentils also vary in size, with or without skin, split or whole. Lentils are used to prepare an inexpensive and nutritious soup all over Europe, North and South America, combined with chicken and pork sometimes.